If there can be such a thing as a beautiful film about depression then this is that movie. Thoughtful, touching and heartbreaking. And wonderful. 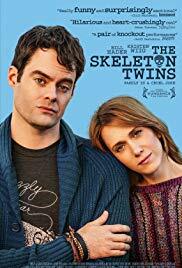 Casting talented comedians Bill Hader and Kristen Wiig might seem an odd choice – and any of their fans expecting a comedy may exit traumatised – but they add a gravitas and contrast that only emphasises the gritty, realistic nature of something that touches so many people. Director Craig Johnson manages to avoid preaching or delivering an obvious lesson, instead offering up a sensitive glimpse into everyday dreams and the downs that often accompany them. Closer to real life than some might feel comfortable with but stronger for it.